We all know (or should) that clutter is simply delayed decision making. Almost everyone can relate to this in terms of their closets. They become filled with clothes that we are undecided about...are we going to lose weight to get back into them, are we ever going to find the perfect top to wear with that skirt bought on sale, are we ever going to wear those shoes enough so they are comfortable? I could go on and on. Our closets are important; don't get me wrong, but where the decision dilemmas matter most is in regards to our papers. And so it is with paper... 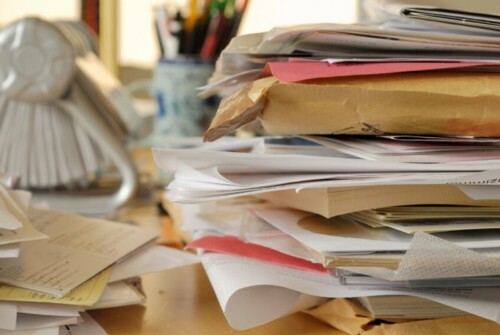 Counters, desks, file cabinets, and storage facilities fill up with paper because we're unwilling to make the time or decision to toss, shred, recycle, or digitize. In reality, however, the problem is really not the paper. The problem is what the paper represents. Paper represents our intentions, our dreams, and our fears—our past, present and future. It's often very easy to help someone else clean up their paper, but very difficult to clean up our own, because we don't want to face our own emotions. This time of year it might be prudent to also include a Tax file. These few files (or piles) will help take the sting out of your paper situation. Paper is harmless in itself, the only power it has over you is what you give it.